After reading India After Gandhi, I was looking forward to learning about more contemporary history and I decided that World War II was the next topic on my agenda. World War II is prevalent enough in public consciousness that I knew a lot of random facts about it, but I wanted an overview of the war and how all the pieces fit together. I wasn’t sure where to start, but I found that the Ask Historians subreddit (which is pretty amazing) has a book recommendation list, which is where I found A World at Arms. 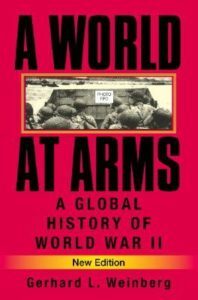 The recommendation entry for A World at Arms describes the book as “one of the best histories of the Second World War from a global perspective”, and although I haven’t read any other World War II histories, I would agree with that. Weinberg covers a vast scope – every theater and front, including the “home fronts” of all countries involved in the war, sociopolitical changes, international relations, economic changes, strategy, and so on. The book seemed meticulously researched, the references are extensive, and Weinberg often mentions which sources he used or did not have access to when proposing a theory for why something happened a certain way. The writing style is somewhat dry, but there’s so much information packed into every paragraph that I didn’t mind at all. Even on days when I was only able to read 20 pages or so, I still felt like I was learning rapidly. Also, didn’t notice any huge biases by the author, which I found refreshing when compared to a lot of other non-fiction I’ve read. I guess it makes sense from such an academic book, though. Because of the scope of the book, most of the detail in it is about high level strategy and machinations; there isn’t much of a perspective from the trenches. I happened to be watching the HBO miniseries Band of Brothers (which follows the American “Easy Company” attached to the 101st Airborne Division) at the same time that I was reading this book, though, and I found that to be a nice “on the ground” complement to the global view that A World at Arms offered.